The life of Eduardo Scarpetta, one of Naples' best-loved comic playwrights, reads almost like one of his own many farces and romantic slapstick comedies. His life was full of improbable situations and exaggerated characters, of which he, himself, was one. Suffice it to say that he is best-known as the father of three illegitimate children: the De Filippos—Eduardo, Peppino, and Titina, who grew up to be the most famous theatrical family of the twentieth century in Naples. Their mother —follow closely— was the niece of Scarpetta's wife. He also had three legitimate children with his own wife, unless one of them was really fathered by Victor Emanuel II, King of Italy, as rumor had it. Ha! The plot thickens. Or maybe thins; that could be any one of a number of plays from Paris in the late 1800s in which there are always fewer closets and beds than there are lovers trying to hide in and under. Scarpetta's grandson, Mario, has commented that the figure of Sciosciammocca, at the time, seemed to be more of what Naples was about (or trying to be about) than did the darker character of Pulcinella. Naples was no longer the capital of an old-line absolutist kingdom. It had recently been taken up into united Italy; it had strivings away from treachery and intrigue, and towards the cosmopolitan and urbane. There was nothing of Pulcinella's cryptic mocking behind Sciosciammocca's "mask" —no psychology. He wore no mask. He was the light, modern, nineteenth-century Neapolitan male, with not even a trace of the tragic Chaplinesque clown; in a way, almost a throwforward to, say, something like Jack Lemmon's character in Some Like it Hot. 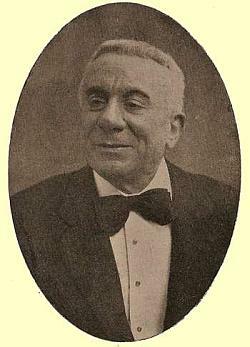 Scarpetta dedicated much of his early activity to translating into Neapolitan the standard Parisian farce comedy of the day, such as Hennequin, Meylhac, Labiche and Feydeau. His own original comedies comprise some 50 works, the best-known of which is probably Miseria e Nobiltà (Misery and Nobility) from the year 1888. The work is well known, too, as a 1954 film featuring the great Totò as Felice Sciosciammocca; the film also features the young Sophia Loren. The plot, roughly, involves poverty-stricken Felice and his friend, don Pasquale, masquerading as aristocratic relatives of a young woman in order to get her parents approval for a marriage to a young prince. The ploy works, of course, and Felice and don Pasquale are rewarded. They splurge on a feast, and the last scene in the film has Felice, don Pasquale, and the rest of the famished family scrambling onto the kitchen table to shove food into their mouths (photo, left). It is this type of nonsensical slapstick that irked Scarpetta's intellectual critics at the turn of the century. They wanted social commentary. Scarpetta just wanted to make people laugh. He wrote his last work in 1909 and passed away in 1925.